In April 2017, Burns Commercial Properties, on behalf of Smith County, Texas, was exclusively retained to offer for sale the Smith County Carlton Building. Agent, Matt Coale, immediately got to work putting together the sales offering and other vital demographics for the sale. The feedback from the community was vast and ranged from everything to “tear it down” to “I can’t wait to see how this turns out” to “put a Chic-fil-a on the entry level floor that’s accessible from Broadway”. While each opinion has its own merits, Matt had to work closely with Smith County to find the ideal investor. After all, the county had some strict guidelines that had to be adhered to after the sell – namely the amount of money that had to be invested into the project. The total costs of the improvements must be at least $1,000,000, including demolition costs and fees of architects and engineers. Within 90 days after closing, permits had to be applied for with construction beginning within 9 months of closing. In addition, within 18 months of closing, the developer should have paid at least $650,000 of the improvement costs. In the end, it was Dallas investor Tanvin Investment, LLC whose offer was accepted by Smith County. The property was closed on January 12, 2018 and intended to be used for multi-family housing. Tylerites should start to see some type of progress around October 2018, if not sooner, and the developer stated he plans to keep the rooftop pool in place. Burns Commercial Properties is honored to have been chosen by Smith County to assist with this project. 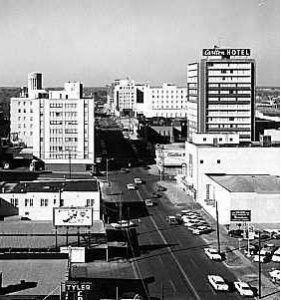 In the 1950’s, the hotel was initially constructed as the Carlton Hotel, a 200-room full service hotel with attached parking garage and swimming pool on the roof. It was described as the “best of the best”, a modern, sleek hotel. After the hotel closed in 1971, the building was remodeled and revised numerous times and was last used by Smith County for general office purposes. Located at the intersection of S. Broadway Ave. and E. Elm Street and situated on 0.606 acres, the building has been vacant since late 2013. It consists of approximately 115,000 SF on 15 floors and has an adjoining multi-level parking garage with 126 spaces.